Some time back, I started a project on GitHub wherein I would explore the efficacy of financial literacy efforts in the area where I live. This is done with the support of a local non-profit organization. As a first step, I tried to draw a picture of the area at a relatively fine level of detail. This relies on the UScensus suite of packages that I wrote about a couple days ago. Today, we'll be looking at data for five counties in North Carolina at the level of a US census tract. First, we'll load up the data and see what levels of homeownership are. Whether or not someone owns their home is a strong indicator of economic stability and the potential to retain and accumlate wealth. What percentage of folks own their own home? We see that it runs the gamut from zero to 100% homeownership. We might assume that areas of higher population have lower percentages of home ownership. Such areas may be more densely populated and urbanized where people are likely to rent. However, there doesn't appear to be any relationship between the total population and home ownership. The construction of a census tract may have something to do with this. We'll recreate the choropleth helper function from two days ago so that we can map this data. 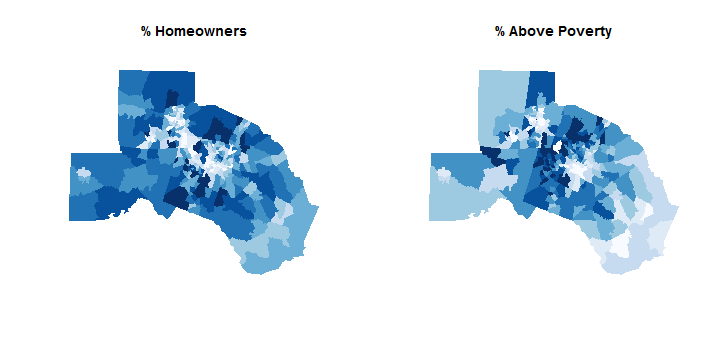 We'll then draw a map that shows high and low concentrations of homeowners. There's a clear geographic distribution at work. In the central part of the map the area between Durham and Raleigh has lower levels of home ownership. These are more urbanized areas, which means they may have more young or transient residents. However, these are also areas of low wealth. We can see this when we load in data from the American Community Survey. Although there are some exceptions (e.g. folks in the RTP) there's visual evidence of a relationship. We can establish this through a simple linear model. I'll explore that in a later post. Tomorrow: not sure what I'll write about! Possibly the PISA testing results that were released this week. ##   Software, 37(6), 1-31. URL http://www.jstatsoft.org/v37/i06/.